i would totally splurge on the LAMB pair!!! These look so much alike. I'd go for the cheaper version. So pretty. Like art. But I would pass on them. I'm afraid. Such beauties! I think the cheaper version would be in my budget. Amazing shoes and to find a cheaper version..even more amazing. Beautiful sandals!! Love the braiding and the color! I like the less pricey version, but I have a feeling the LAMB ones are more comfortable. Have a wonderful day to you! I really wish I had those shoes for tonight's outfit. Hot! I will definitely be a frugal fashionista on this one ~ thanks! I agree with Joanne and prefer a lower heel for the summer! Wow!! An exact replicate! I actually prefer the color on the frugal find, so I would go with those for sure! Wow, instant love with the L.A.M.B no doubt ... even if I have to save all my pennies. These are so similar but I prefer the lower platform on the Type Z shoes. Cute! I think I would still go for the LAMB version :) I like the colour and platform a lot better! Wow! These are pretty much identical! I think I like the platform on the Type Z better- love this look! So dolce vita! they both look sensational but the lower priced will always win. I like the Type Z ones even better! I love Gwen Stefani but not enough to pay $325 for a pair of heels. I actually like that the Type Z pair are a bit lower! :) Call me cheap!! LOL! Hope you are having a great day. You had me at 'Cognac':). I'm loving the LAMBs for sure! i think the colour, heel and platform on type z looks better, so tightwad it is! i would go with the type z. i actually quite fancy the darker shade. it's more my color!! Super cute...but I couldn't walk in either pair lol! Oooh, I love the type Z because they are lower! Cute! So pretty. I love the braid detail. totally the steal! i couldn't wear the LAMB ones...too high! What an amazing find! i would def save me some money and go with the pair thats more in my budget! killer shoes! hope all is well Ericka! ps: YOU have no idea how much i love " play again Sam"!! Beautiful. Now, I just need to find an outfit to go with them. Sweet header! Awesome shoes too! Gorgeous find, they look almost identical! Definitely going for the cheaper one. I like them both! 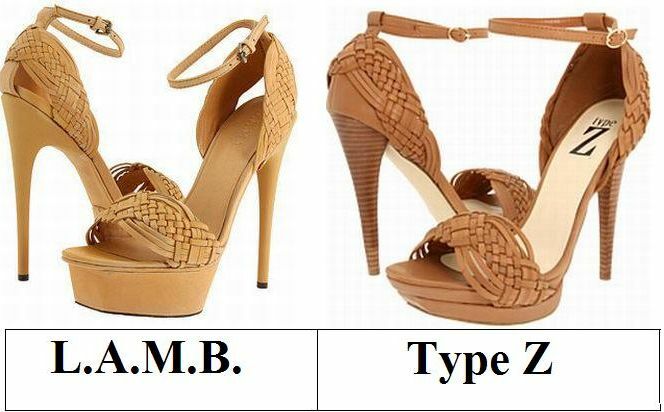 I love the heel on the L.A.M.B., but I like the front strap better on the other. And with the price difference? Save, for sure! i actually like the chunkier look of the LAMBs. They are look the same..hmmm.. I'll go the the cheaper one..:) Fashion trends nowadays are really great..